And I, for one, am here for fellas rocking some serious layers. So let me formally invite you to cast all your tank tops and t-shirts to the back the closet to be eaten by moths. Time to pull out all the heavy-on-the-handfeels fall and winter favorites, from cable-knit sweaters to cardigans. So, why is cable-knit so great? From apple orchards and pumpkin patches to bar-side fireplaces, cable-knit looks right at home in cold weather settings. Each type of knit holds a different meaning, so whether you opt for braids or lattices or the tree of life, the heritage of the knit can warm your heart while the sweater, ya know, warms your body. SG Says: Suit up for the cooler days by layering your cable-knit sweater between your shirt and jacket. SG Says: Keep things cozy with cords and a chambray shirt. SG Says: A cable-knit sweater is the perfect weight for a brisk walk to work, followed by refrigerating in the office AC all day. SG Says: A coach’s jacket and stylish cargo pants give a classic sweater some welcome modern flare. SG Says: Your significant other will appreciate the extra effort that you put in for the requisite pumpkin patch Instagram shot when she sees you’ve layered a “nice” sweater under your puffer vest, rather than a hoodie (not that we have anything against hoodies at SG HQ, but y’know sometimes it’s a good change of pace to upgrade…). We love cable-knit turtlenecks, too. Well, we love any kind of turtleneck, really (here’s how to wear one with a suit! and here’s how to wear one five more ways). What makes v-neck sweaters so great? When it’s uncomfortable to leave the house without an extra layer, a v-neck sweater is a great transitional piece for your wardrobe. If you’re ready to go all in on your sweater game, we recommend splurging on one in cashmere. None of your other sweaters can even compare in luxurious coziness when cashmere enters the ring. So soft, so warm, so timeless, so can’t-keep-our-hands-off-you. SG Says: Winterize a suit for the office with a layer of cozy layer between your shirt and jacket. SG Says: Now this is how to bring gingham into your cooler weather wardrobe…grounded in earth tones and sturdier fabrics for colder temps. SG Says: Throw the vest on for to and from the office in early fall, and to make things more fun at happy hour after work! SG Says: Yes, you can pull off camo pants. How? By keeping the rest of your color palette neutral and mostly monochromatic. SG Says: We’ll literally never say no to including a jean jacket in an outfit. Ditch the tie and sunglasses to make this a ‘night out’ look. It’s probably obvious why Team SG love crewneck sweaters for guys so much. Because they’re so easy to wear! Crewneck sweaters go with everything – jeans, trousers, chinos, a blazer, a jean jacket, a shirt and tie. And on and on (and on). Chances are, you even received a new one at the holidays, and for good reason. It’s the sweater that keeps on giving. While your version of this timeless classic could be made from cotton, wool or cashmere, we like a thick, wool crewneck when it’s really cold out. SG Says: Want to know how to wear a crewneck sweater to work and not look like the junior account executive on the team? By pairing it with a sport coat. Ideally one that has patch pockets. SG Says: How do we love a chambray shirt, twill pants and desert boots? Let us count the ways. Because they’re all in this outfit, and we’re seriously going heart eye emojis-gaga for it. SG Says: Okay, okay. So this outfit may be more of a “Saturday” vibe than a “Wednesday” vibe, unless your Wednesdays are seriously vibey. …In which case, how did you get to doing what you do because I think I’d like to do it, too? SG Says: Love us some flannel. Love us a leather boot. Love this whole look, really, so why not go ahead and wear it?! SG Says: We love a lot of layers in a guy’s outfit, so a crewneck sweater over an OCBD is extremely #SGapproved. So long as there’s no snow, you’re perfectly good to go in a low-top Chuck and wool socks. Why does Team SG love Nordic sweaters for guys? It’s seriously simple to fall into a style rut when the temperature drops below freezing. You just want to be warm and cozy! But much like wearing a yellow slicker on a rainy day, sometimes it takes sporting a playful sweater to help you face the weather with your head held high. A Nordic print-inspired sweater can help you do just that. The key difference between Fair Isle and Nordic prints is the symmetry. Where Fair Isle prints are repeating, symmetrical patterns that continue for (what feels like) eternity, Nordic prints have varying sizes for each component, often featuring larger-scale playful motifs, such as woodland creatures or snowflakes, interspersed between smaller, more geometric motifs. Nordic print sweaters are also generally a little thicker and sturdier than their Fair Isle cousins thanks to their three-ply yarn construction – making them an even warmer option for the more miserable colder, later months on the winter season. SG Says: Nordic sweaters go all in on the “visual interest” element of a good outfit. With varying widths and patterns, there’s no way not to feel fun and stylish in this winter classic. 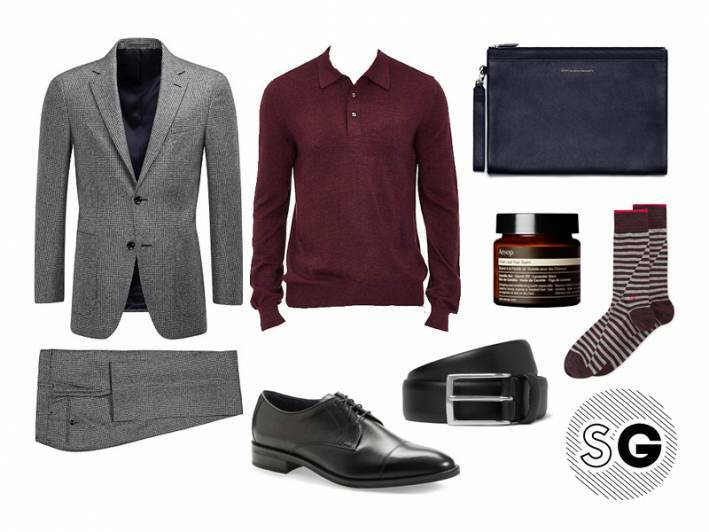 SG Says: Make your suit feel like sportswear by wearing it with a sweater and sleek sneaker-dress shoe hybrid. SG Says: Treat your sweater more like a long-sleeve tee by wearing it under a roomy shacket (shirt jacket). The whole outfit will be perfectly coffee run-casual with joggers and a beanie. SG Says: Another way to bring gingham into your winter wear..by letting just a bit peek out from under a coordinating (but not matchy-matchy) patterned sweater. SG Says: Round up all the winter textures by pairing a leather jacket with winter white corduroy pants for super-sized sumptuousness. What is a sweater polo and why should you wear one? There are so many miracles in our closets that are appropriately named – take, for instance, shackets! And skorts! So what do we call the outcome when a top is half sweater, half polo shirt? A “swolo” simply does not give it the esteem it deserves. Especially for a top that combines the casual cut of a polo with the elegance and ease of a long-sleeve sweater made from fine gauge wool. It’s the kind of clothing that’s as comfortable as pajamas but pairs perfectly with your boardroom suit.Regardless of what it’s called, know that it is calling you this fall and winter. SG Says: Swap out your usual shirt and tie for this winter wonder-polo. SG Says: Double up on your collars (just don’t pop them). SG Says: Pair a history teacher-worthy blazer with expedition-ready cargo pants and boots for a refined, yet rugged Indiana Jones outfit vibe. 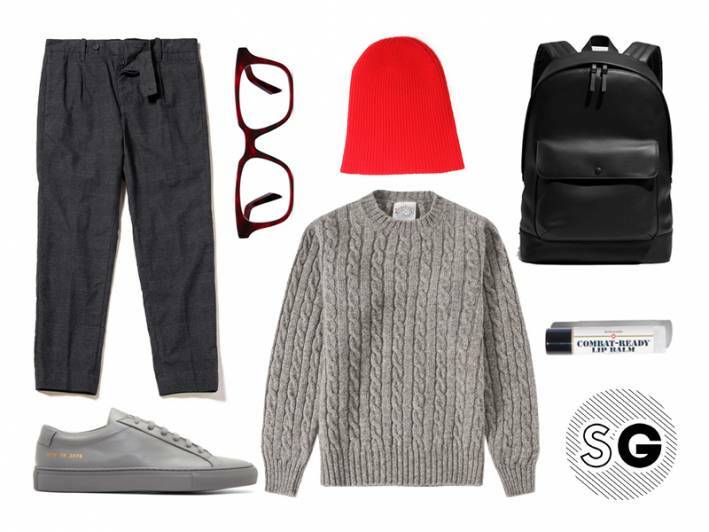 SG Says: Upgrade your errand run outfit without sacrificing comfort. Later, ditch the baseball hat and you’re ready for date night. SG Says: Go tonal and textured in soft shades of suedes. And yes, you can totally pull off millennial pink. Here’s how. Why do we love sweater vests on guys? They’re so unexpected! Before you guys beat me to the punch, we’re not talking about Mike Ditka’s Bears sweater vest or your uncle’s argyle holiday staple. A thin button-front sweater vest is a great shortcut to a three piece suited look, with the added comfort of fine cotton. In the autumn months when temperatures can shift from sweater worthy to sweltering, layering with year-round wool and thin cotton (or linen blend) is integral to keeping comfortable…and dapper. Wear it well: Highlight the brown in your trousers and patterned blazer with a burnt orange tie that also ties in the blue vest. While we’re all for a full-patterned suit, you can easily tone down the look by opting for solid light brown wool trousers to play off of your check blazer. My grandpa had the best cardigan, of which I am now the proud owner (and frequent wearer). A buttery yellow, made of ancient mohair worn soft from years of use, he would sport it with a bolo tie cinched around a polo shirt collar, pants hitched high on the torso, his submariners cap crooked on his head. And he pulled it off perfectly. You’re probably all, Gabi, wearing a cardigan may be well and good on the coasts, but what about me, living in (BORINGVILLE, USA)? Can I really pull this hipster look off? Yes, you can! In fashion, a happy medium does exist where this look can work for every guy. Just follow the tips below, and you’ll be styling – sans bolo OR ironic glasses – in no time. A cable-knit cardigan is great. So is cashmere. So is merino wool. Skip the thinner fabrics, which tend to look a bit, well, cheap. If your cardigan has buttons, consider keeping them closed for a more polished effect. The bottom button can be left undone to help it sit on your hips without riding up over your waistband. So often, it’s not about what you wear, but how you wear it. The stylish man must master the art of the “zhush” to truly complete a look. When wearing a long-sleeve shirt under your cardigan sweater, yank the cardigan’s sleeves up at the elbow, so the sweater hits about three inches above your wrist. Next, pull the long sleeves underneath past those of the cardigan so both shirts are visible. SG Says: With joggers and a retro sneaker, this outfit would work for a college student or a young professional on the weekends. SG Says: You can get away with a cardigan at work, so long as it’s dressed up accordingly. Pair yours with a button-down shirt, slacks and a brown dress shoe shoe. In a more casual office, chinos with a well-scuffed boot will do. For the office, gray is a good neutral color to keep the look professional. SG Says: Take this easy East coast prep vibe and turn it up a notch with grey boots for an unexpected twist on a classic look. With Americana tennis stripes in basic colors, you can layer this cardigan with jeans, or dress it up more by wearing it in place of a blazer at the office. 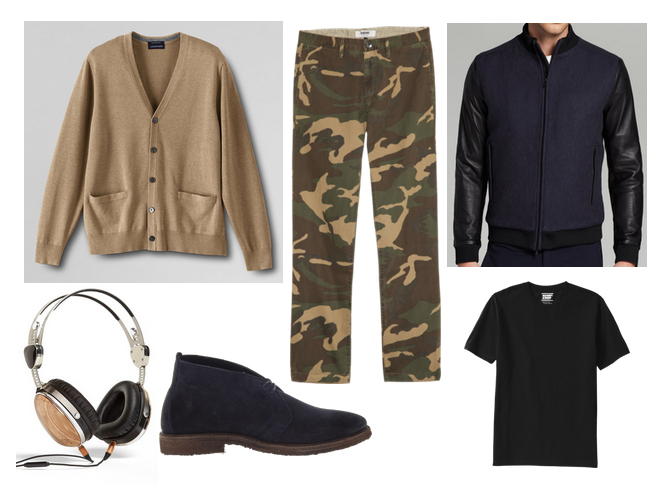 SG Says: On the weekends, feel free to pair your cardigan with a t-shirt and camo for a relaxed – but not, Mr Rogers after he puts his sneakers on-relaxed – look. SG Says: Another great office outfit option. Wear the penny loafers with no-show socks to keep things looking young and not stuffy. Why does Team SG stan a shawl collar sweater? The shawl collared sweater is officially “trendy” again, though here at SG HQ, we never fell out of love with this cozy, stylish sweater. Why not take advantage of the cold (or, for those of you in warmer states, “cool-ish”) weather, and rock yours this week? Or if you don’t yet have one, go shopping. What has multiple textures, a playful pattern, and is sure to get you some eyebrow-raising (in a good way) glances? Answer: a layered fall look that will make you feel comfortable, but certainly standout. Start with a lightweight shirt that’s engineered with a double cloth weave to add texture and temperature-fluctuating muscle – this will make it so you don’t overheat once you step indoors during a chilly fall day. Bring the look home with a Western-inspired patterned shawl collar sweater paired under a sturdy, warm cotton jacket. SG Says: Here’s how to wear one sweater on three different days (hopefully not consecutively, but hey, no judgment on your current laundry situation). SG Says: A shawl collared cardigan? You bet. Especially with retro-looking sneakers, and chinos in a saturated blue. SG Says: For a shawl collar sweater you can wear all fall and winter long, avoid an “Is this an ugly Christmas sweater, or…?” situation by choosing your patterns carefully. Opt for sweaters that steer clear of any hints of snowflakes, and make sure the rest of your look is more rugged with leather boots and military-inspired outerwear.